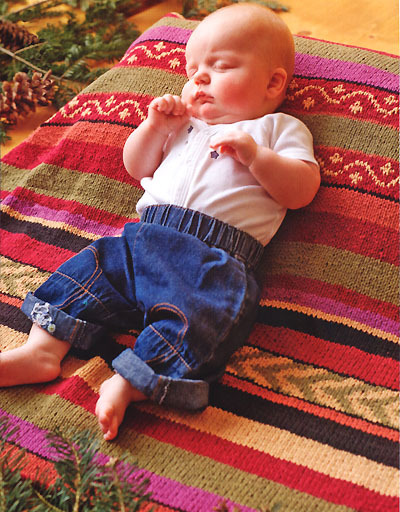 A wonderful knit baby's blanket from the Mission Falls Homecoming pattern book. This is knit with Mission Falls 1824 Cotton and the yarn kit is shown below! If you would like to order the kit with alternative colours or in Mission Falls 1824 Wool, please specify these in the comment field of your order form. The pattern is not included in the kit but is in the Mission Falls Homecoming pattern book (pictured at right) which can be ordered separately. Normally priced at $7.95 CDN ($6.95 US), if combined with any order of 5 skeins or more of Mission Falls yarn, the Homecoming book is priced at $4.95 CDN ($4.35 US).